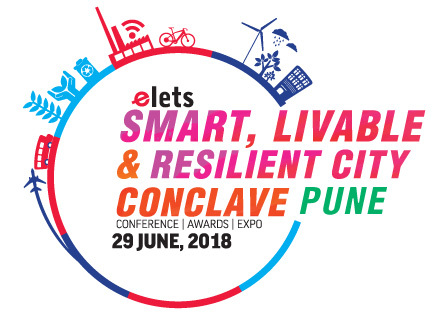 In an endeavour to discuss the vision, sustainability and resilient attributes of Pune, the Pune Smart City Development Corporation Limited in association with Elets Technomedia Pvt Ltd is organising ‘Smart Livable and Resilient City Conclave-Pune’ on Friday. The summit will be presided by Girish Bapat, Minister for Food, Civil Supplies and Consumer Protection, Food & Drug Administration, Parliamentary Affairs, Government of Maharashtra. From Pune, Mukta Tilak, Mayor, Pune, Anil Shirole, Member of Parliament, Dr Rajendra Jagtap, CEO and Executive Director, Pune Smart City Development Corporation Limited (PSCDCL), Saurabh Rao, Commissioner, Pune Municipal Corporation (PMC), Shravan Hardikar, Commissioner, Pimpri Chinchwad Municipal Corporation (PCMC), Nayana Gunde, Chairman and Managing Director, Pune Mahanagar Parivahan Mahamandal Limited (PMPML), Manojit Bose, Chief Knowledge Officer, Pune Smart City Development Corporation Limited, Govind M Bodke, Commissioner, Kalyan Dombivli Municipal Corporation, Dr Rajendra Nimbalkar, Additional Commissioner (Special), Pune Municipal Corporation, Sameer Unhale, Additional Commissioner, Thane Municipal Corporation will address issues as to development and sustainability in Pune. Other delegates that are expected to participate in the event are: Nitin Bhadauria, Vice Chairman, Haridwar Roorkee Development Authority and Commissioner, Haridwar Municipal Corporation, Balaji Khadogonkar, Commissioner, Mira Bhayandhar Municipal Corporation, Dharmendra Snakara, CEO, Fintech Valley, Vizag, Government of Andhra Pradesh, Hari Chandana Dasari, Additional Commissioner, Greater Hyderabad Municipal Corporation and Ravindra Ranade, Business Head – Public Sector, HPE, Vivek Kharpude, Head Presales, ESDS Software Solution Pvt Ltd, Rohit Dembi, Lead GIS, NJS Engineering, Dr Abhijeet Chaudhary, Commissioner, Kolhapur Municipal Corporation, Amit Sharma, Regional Director, Survey & Land Records, Government of Jammu & Kashmir, Hiren Pravin Shah, Director Energy Storage, Delta Power Solutions and Zoeb Karampurwala, General Manager, Vehicle Integration, Tata Motors. The panel discussion on ‘Affordable and Sustainable Housing for Urban Poor and its Significance for the Development of Smart Cities’ will also be conducted.